Visiting the Pollinator Link garden of Bernadette and Len Crook is like an adventure in a botanic garden. 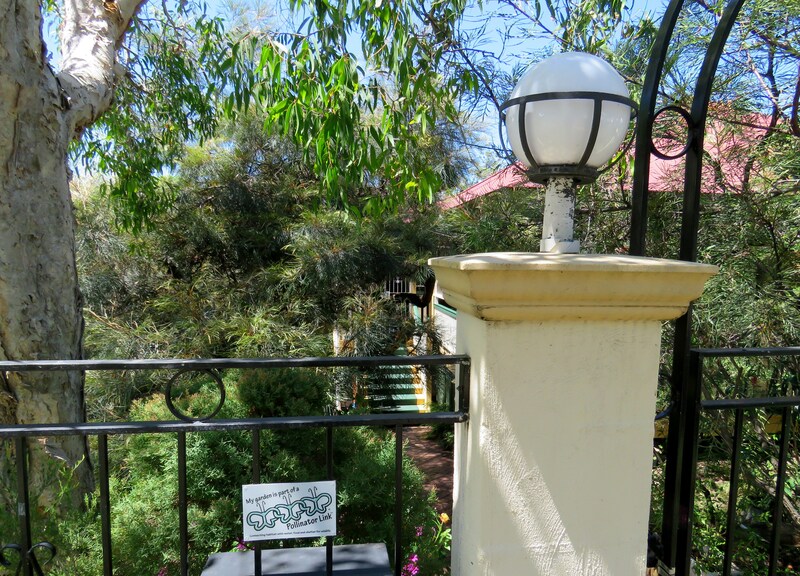 Step through the front gate straight into an urban forest habitat supporting bird, butterflies and bees. The balcony provided an ideal location for me to appreciate the plant diversity and the cool shade of the dappled garden. 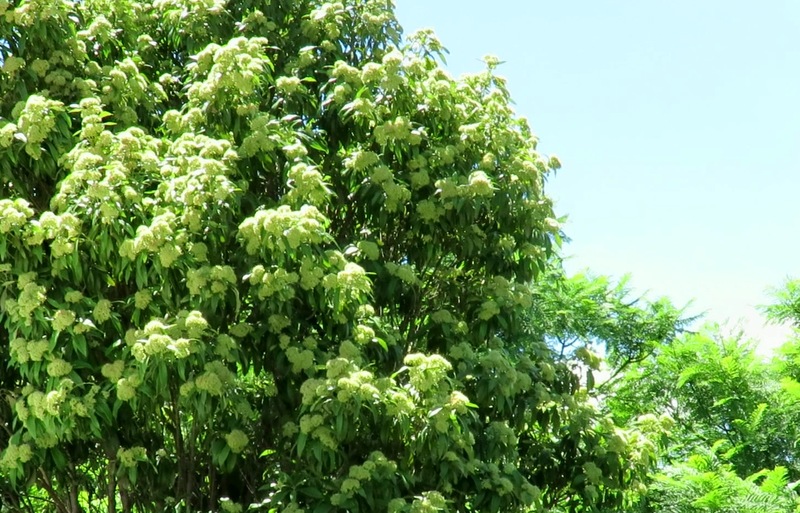 Like visiting a botanic garden, I also learned about a beautiful native tree very popular with Rainbow Lorikeets Trichoglossus haematodus, fruit eating birds, like the Australasian Figbird Sphecotheres vieilloti, and nectar hunting butterflies. 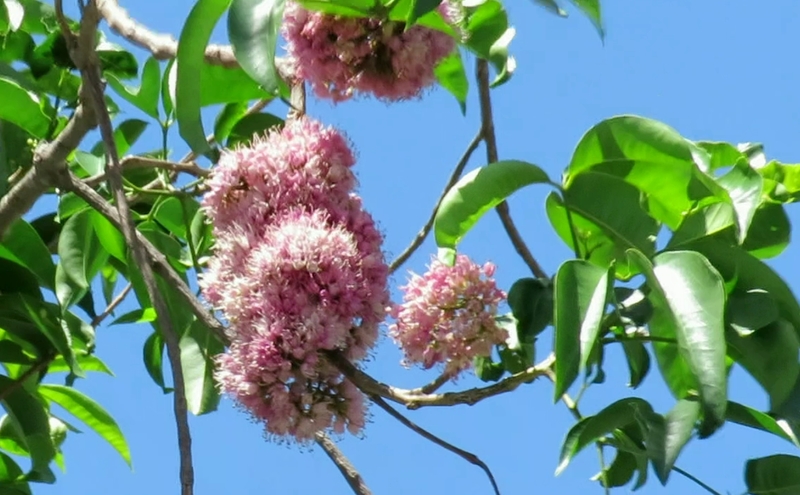 The Pink-flowered Doughwood Melicope elleryana is a rainforest tree found in coastal areas from North Queensland to northern NSW. 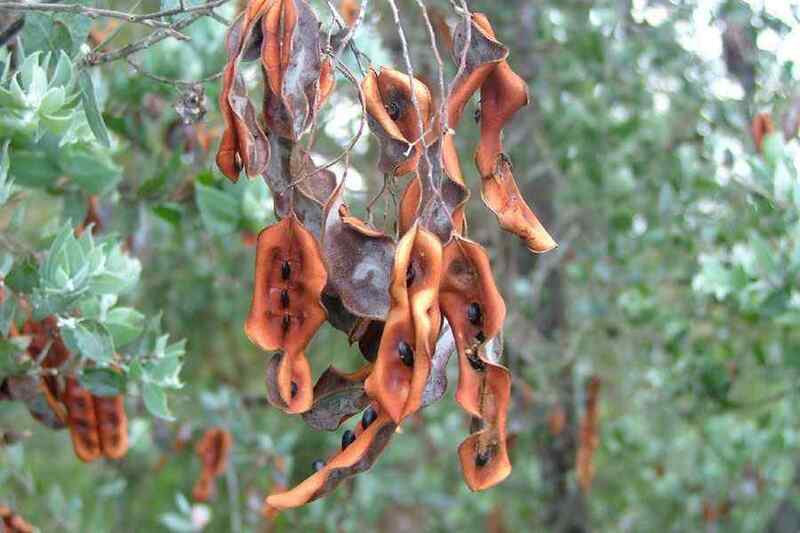 A fast growing tree that loves full sun and moist conditions. 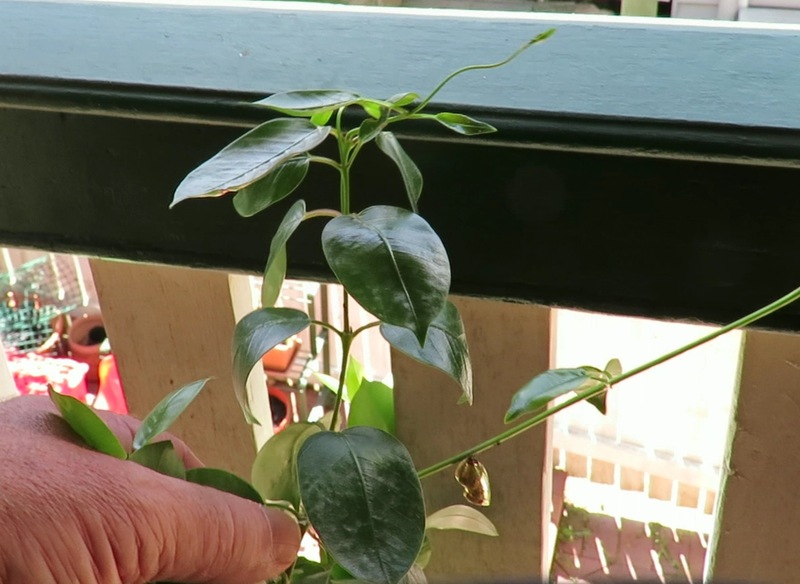 The Lemon-scented Myrtle Backhousia citriodora is a versatile Pollinator Link plant that can be grown in a pot on a balcony garden or used as a screen in the backyard. Lemon-scented Myrtle not only attracts birds, butterflies and bees, it is also a versatile bush food used in teas, cakes, biscuits, sauces, ice creams, and meat dishes. 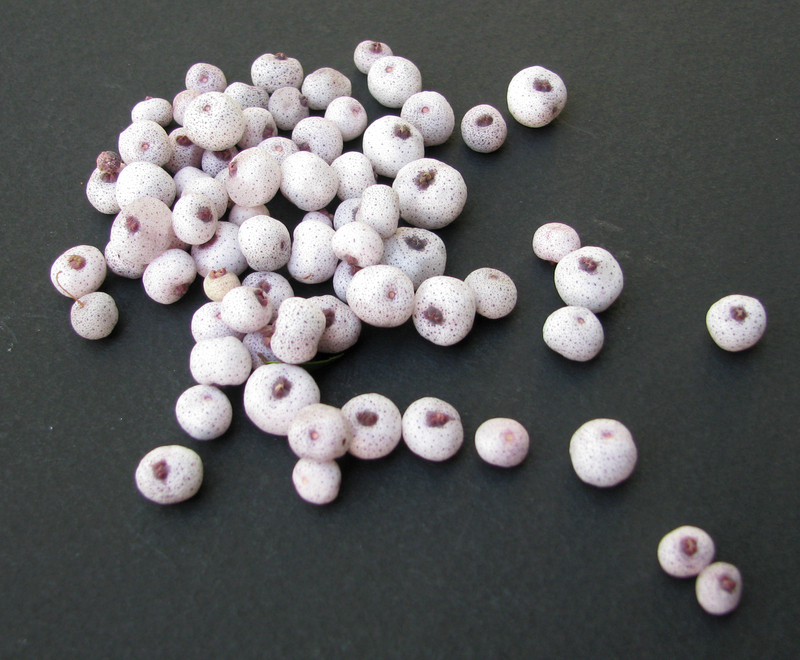 Midgen Berry Austromyrtus dulcis is a white flowering low growing (Height 0.5m Width 1.4m) shrub producing pretty tasty fruit bound to tempt young visitors to your garden. Silver Wattle Acacia podalyriifolia with its attractive silver grey foliage provides a year round backdrop complemented with regular displays of bright yellow flowers. 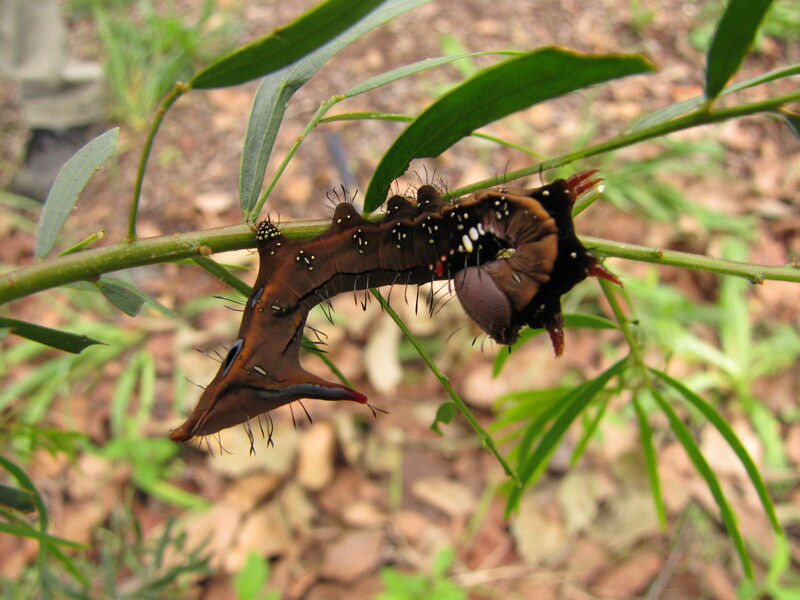 Seeds provide food for seed eating birds and foliage caterpillar food for Granny’s Cloak Moth and the curious Wattle Notodontid Moth Neola semiaurata caterpillar. 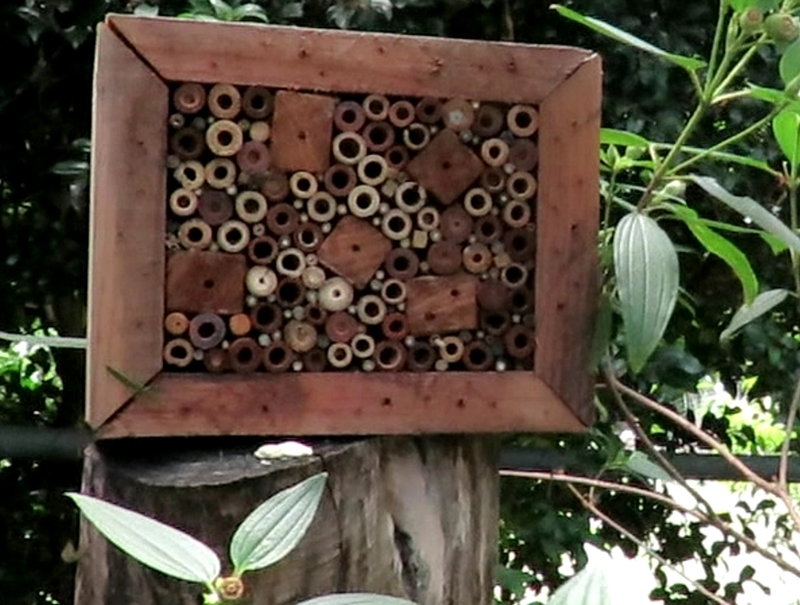 Take a leaf out of Len’s book and make your own Backyard Bee Home as an attractive sculpture for your garden and Shelter for solitary native bees like Leaf Cutter and Resin Bees. Australia has over 2,000 solitary bee species that hatch out in spring to pollinate our gardens. Blue-banded Bees are particularly valuable pollinators of tomatoes and other vegetables. 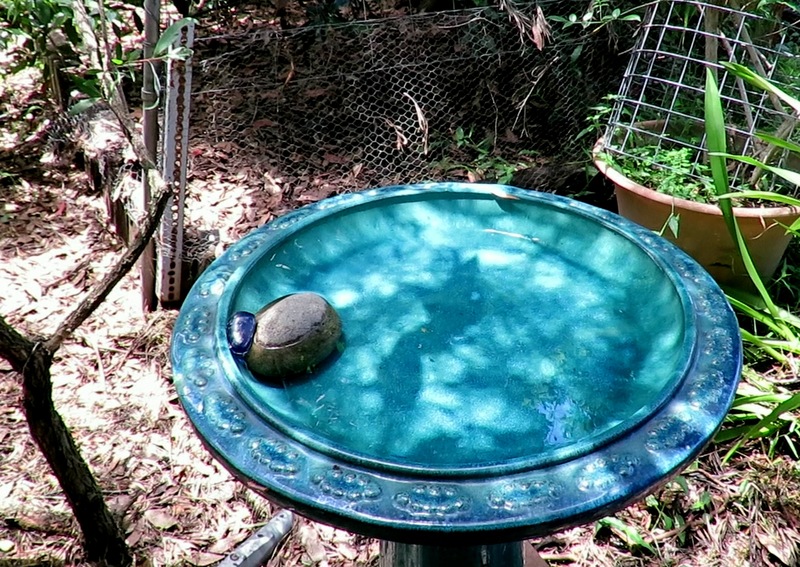 Some rocks or sticks in your birdbath will allow insects and lizards to escape if they fall in. 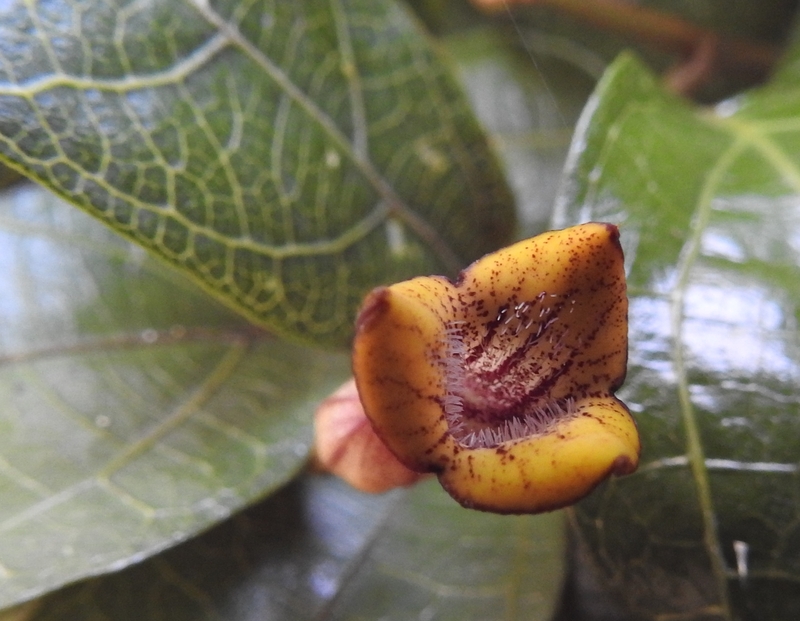 Planting Richmond Birdwing Butterfly Vines Pararistolochia praevenosa is a valuable contribution to conservation of this spectacular but vulnerable butterfly. 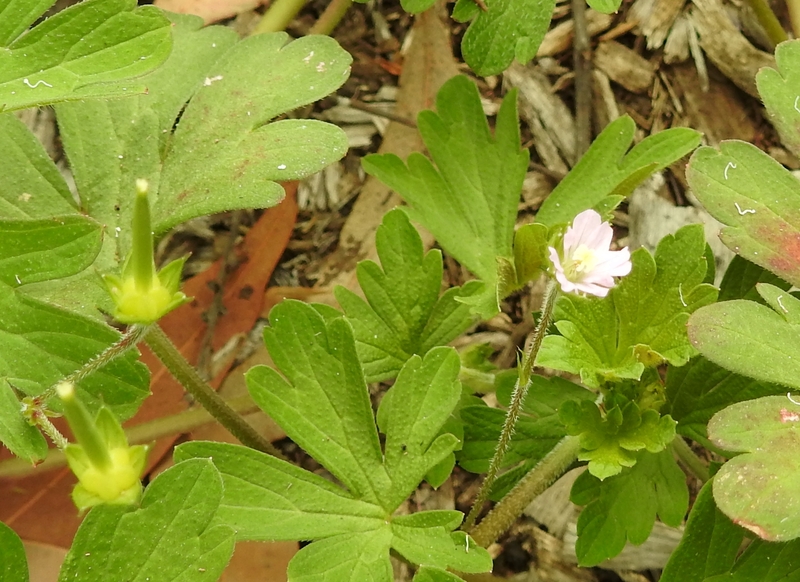 Native Geranium Geranium solanderi is a hardy native herb that is happy in dry conditions like a rockery. 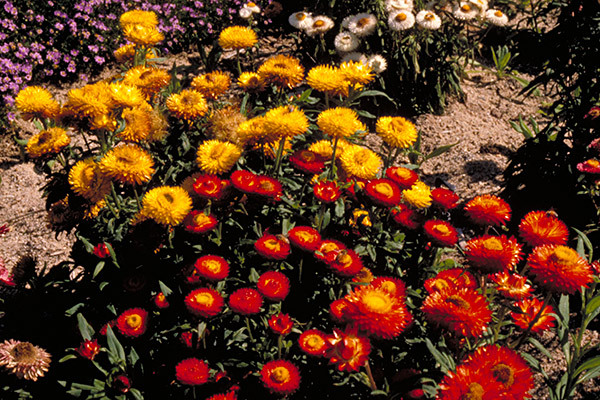 Golden Everlasting Daisy Xerochrysum bracteatum and the wide range of cultivars will add a splash of colour to your garden and provide caterpillar food for the Australian Painted Lady Vanessa kershawi butterfly. 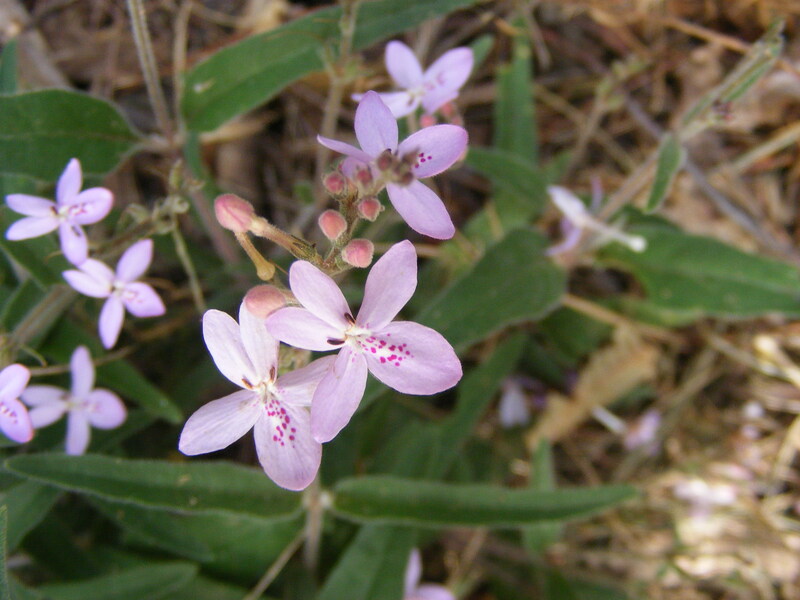 The delicate Love Flower Pseuderanthemum variable is one of my favourite Pollinator Link plants providing Food for five butterfly species: Australian Leafwing, Blue Argus, Blue-banded Eggfly, Danaid Eggfly, Common or Varied Eggfly. This entry was posted in Pollinator Link, Wildlife Corridor and tagged Australian Leafwing, Australian Painted Lady Vanessa kershawi, Backyard Bee Home, bees, Bernadette and Len Cook, Birds, Blue Argus, Blue-banded Eggfly, Brazilian Jasmine Dipladenia sanderii, Bush food, Butterflies, Common Crow Euploea core, Common or Varied Eggfly, Danaid Eggfly, Golden Everlasting Daisy Xerochrysum bracteatum, Lemon-scented Myrtle Backhousia citriodora, Love Flower Pseuderanthemum variable, Midgen Berry Austromyrtus dulcis, Native Geranium Geranium solanderi, Pink-flowered Doughwood Melicope elleryana, Rainbow Lorikeets Trichoglossus haematodus, Richmond Birdwing Butterfly Vine Pararistolochia praevenosa, Silver Wattle Acacia podalyriifolia, Wattle Notodontid Moth Neola semiaurata. Bookmark the permalink.